Do you have an Elf on the Shelf? Sometimes Elves need a little reminder to report back to Santa. Did you know there was a text alert club? Elf on the Shelf is an adorable Elf which you adopt from an adoption center and he/she comes with a book telling the story of the Elf on the Shelf. Your Elf will report back to Santa at night and then return back to your home. During the day your Elf will hide in plain sight at your home and not move. Children must not touch their Elf or your Elf will loose his/her Magic to be able to return to the North Pole to report to Santa. Why do the Elves go to a new spot each day? Some Elves like to be mischievous and hide in a new spot each day. It’s also possible that your Elf was on his/her way to their favorite spot but got interrupted by someone and they had to freeze. If your Elf doesn’t move spots that’s ok because some Elves like to return back to their favorite spot. 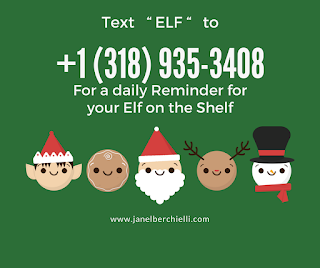 Why does my Elf need a text alert? Sometimes your Elf will need a Friendly reminder that it is time to report back to Santa. Since your Elf doesn’t have a cell phone an adult will be able to help your Elf sign up for text alerts on their phone. 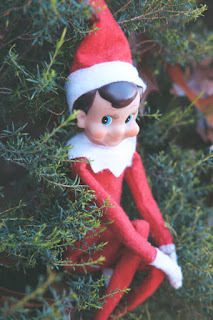 Elf on the Shelf will soon become a fun family tradition everyone in the family will enjoy year after year. Even though my kids are now grown they still enjoy our Elf coming to visit our home each Christmas season.